A 7 year-old twin presented to the general paediatric clinic with persistent and longstanding torticollis and concerns that the right side of his body was smaller than the left. He tilted his head to the right and this was initially ascribed to a squint. The examination confirmed right torticollis, mild weakness of the right arm (MRC grade 4), left hemi-hypertrophy, right sternocleidomastoid tightness, and posterior positional plagiocephaly. A brain and spine MRI was performed and showed a Chiari I malformation with tonsillar descent of 15 mm and a large cervico-thoracic syringomyelia (figure 1). A foramen magnum decompression with dural opening was performed, with no immediate post-operative complications. The patient was discharged in a good condition a few days after the operation. Three weeks following surgery the child was reviewed in the neurosurgical clinic with behavioural issues; he was tearful and quieter than normal. A CT scan was performed showing no post-operative complications or hydrocephalus and confirming a satisfactory foramen magnum decompression (Figure 2 A-B). The child was then referred to the neuropsychology team. A further two months later the patient was admitted with reduced GCS, headache and vomiting. 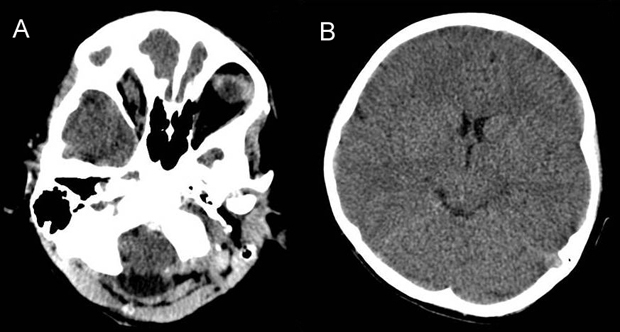 An urgent CT scan showed intraventricular haemorrhage, mainly localised in the third and fourth ventricle but with a subarachnoid component (Figure 3 A-B). An urgent external ventricular drain was inserted and the neurological condition significantly improved. MR angiogram and venogram (figure 4 A-B) and formal angiogram did not show any evidence of a vascular malformation. Ten days after admission the external ventricular drain was removed and the patient did not require a permanent CSF diversion. At six month follow-up the child looks in very good condition, the torticollis is completely resolved and his mood is back to normal. Medical genetics, haematology and endocrine reviews revealed no underlying condition that would explain the haemorrhage. It is possible that the subarachnoid haemorrhage which occurred was unrelated to the surgery but extensive vascular imaging did not reveal any predisposing anatomical cause such as aneurysm or arteriovenous malformation. There was no clinical evidence to support a systemic vasculitis. There have been reported cases of delayed haemorrhage related to the use of certain graft materials3 but none were used in this case. The authors acknowledge that a potential mechanism would be stretching of subdural veins caused by significant cerebellar slump but do not believe this to be the likely mechanism as the ventricular distribution of the haemorrhage would not be in keeping with this aetiology and no cerebellar slump was demonstrated. In consultation with a geneticist the authors did not identify any syndrome linking the Chiari malformation, hemi-hypertrophy and haemorrhage. The authors report this rare case both to alert the community to this potential late complication and to invite comment from others who may have experienced a similar complication in order to identify any possible causation. 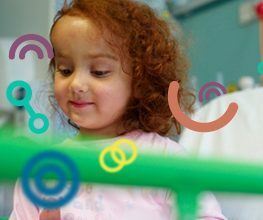 This case of the month was prepared by Benedetta Pettorini and Chris Parks of Alder Hey Children’s NHS Foundation Trust. Many thanks to them for another interesting case.